It’s now 8pm on day 6 and I’m at 16,000 feet. 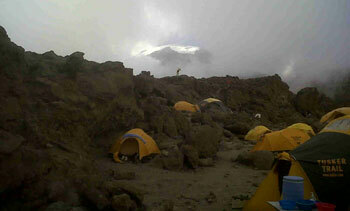 This is my last ascent camp, known as Barafu Camp. Summit day is tomorrow and we start out at 3am in the morning with our target to summit at noon or 1pm. Wish me luck!!! Here’s is a pic from our camp. See the summit off in the distance?